The genesis of the Sutton Complementary Health Network (SCHN) was at the 1995 Focus on the Future Forum, where a disparate group of strangers sat down together to create a vision for the future in the London Borough of Sutton (LBS). One of the nine goals to come out of that weekend was ‘Healthy communities and lifestyles – more preventative, holistic and lifestyle healthcare’. From there, with the assistance of the Centre for Environmental Initiatives – now Ecolocal – and Local Agenda 21 (LA21) small grants funding, we devised and conducted a survey to identify local complementary practitioners. We also contacted GPs, care homes and clinics to establish current and potential use of therapies in the borough. Those surveyed were also asked to comment on the need for a register of complementary therapists to which patients and clients could be referred. Feedback was very encouraging. The majority were in favour of producing such a register, and even setting up a community complementary healthcare centre. 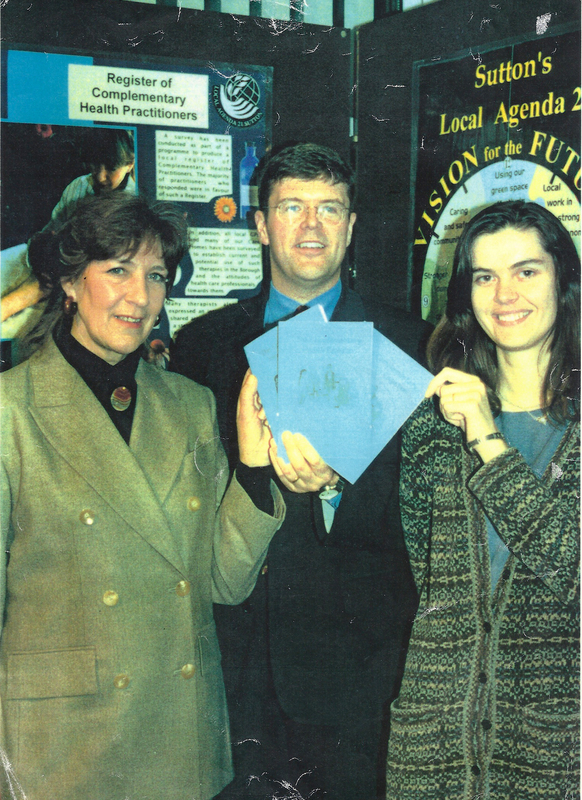 We produced a promotional leaflet and distributed it at the 1997 Environmental Fair, which resulted in more therapists coming forward, keen to be included, and very importantly, prepared to volunteer their time to set up a core group and develop the network. 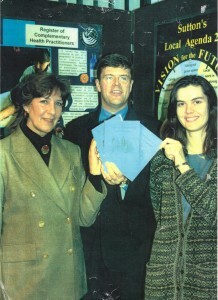 Copies of the first CHN register were handed out to members of the public at Sutton’s Central Library on 20th November 1998 when the Network was officially launched by Paul Burstow, MP, together with myself and Margery Keable, as first Chair and Secretary respectively. The name was changed to Sutton Complementary Health Network in 2004. Part of the LA21 initiative ‘Health in the Community’ programme, the register and the network were also in accord with government policy to broaden the debate on health issues, following the Green Paper Our Healthier Nation; its aim, to offer the public a wider choice of healthcare in tandem with the National Health Service. Our stance was, and continues to be, co-operative and educational. Our objectives, to bring about a greater public and professional awareness of the theory, methodology, effectiveness and availability of complementary therapies for the benefit of our local community. Therapists living or working within LBS are always welcome to join us, and benefit from our regular talks and events.